For preparing food, building traps and generally making your way through nature, a good multi or folding knife is essential. It makes life a whole lot easier if you have the tools to take care of most jobs all in one, and at Camping Things we like to think we know a few things about getting the job done. These are our picks of the best multi-knives and folding knives, which combine superb quality and value for money. We’ll give you a full run-down of what’s included in the Leatherman charge in just a second, but know this: The Charge is serious business, intended for use in extreme conditions. There’s no job the Charge cannot handle for its size, and these are pro-level tools. 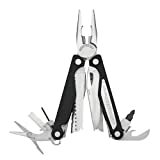 If you’re in the market for one of the best, most comprehensive multi-tools around, you’ve found it. 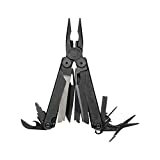 Not only does the Leatherman Charge AL Multi-Tool come in a sweet leather pouch, the tool itself is of fantastic quality. No loose parts or cheap-feeling components, every part of the Charge is built to perform. It isn’t cheap, but then it does look or feel cheap, either. This is as close to perfection as it gets. And every one of those tools is of professional quality, meaning it’ll perform and last under even the harshest conditions. Buy this tool now. You will not be disappointed.